Three days back Apple launched the 5K Retina iMac. 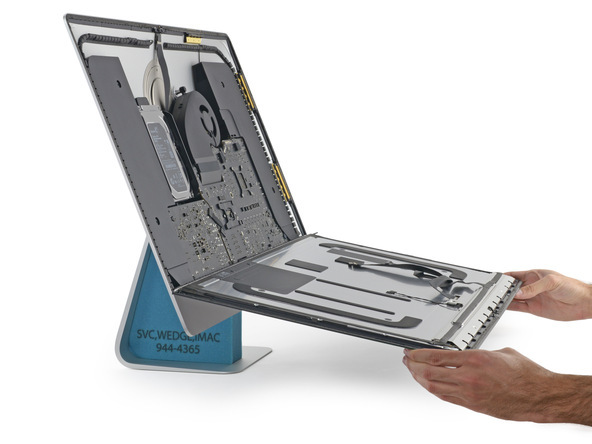 The 5K screen of the iMac is the first of it’s kind in the industry and had us all wondering what lies under the hood of the iMac. Apple provided a little bit of information about the iMac at the time of launch, solely for marketing and branding purposes. 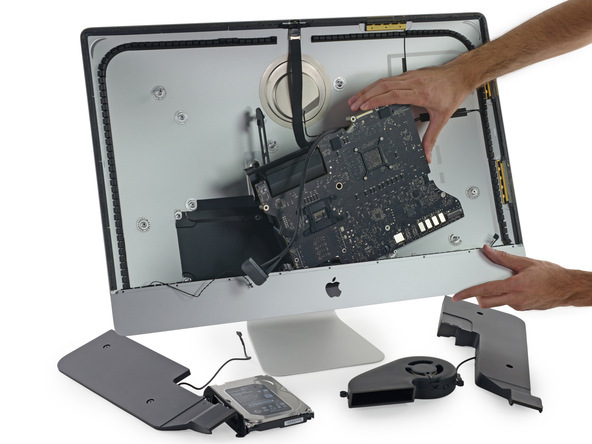 Well, folks over at iFixit have taken apart the Retina iMac and thanks to them, we can finally take a look at what makes the Retina iMac tick. Before we start with our teardown post, it would be wise to take a note of the specifications of the Retina iMac in question. The device being taken apart comes with a Quad-core 3.5 GHz Intel Core i5 with Turbo Boost up to 3.9 GHz. This is backed by two modules of 4 GB 1600 MHz DDR3 RAM and AMD’s R9 M290X GPU with 2 GB of GDDR5 memory. 802.11 ac Wi-Fi and Bluetooth 4.0 are the specifications for wireless connectivity. 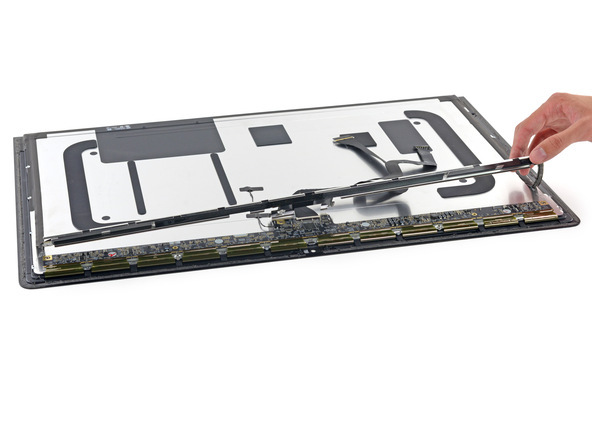 The Retina iMac comes with a host of ports on it’s rear to satisfy all of your peripheral connectivity needs. 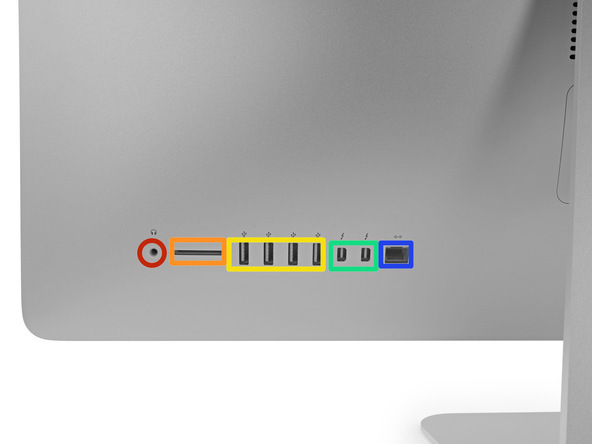 Adorning the rear of the device are: In red – a headphone jack, in orange – a SDXC card slot, four USB 3.0 ports in yellow, two thunderbolt 2.0 ports in green and finally a gigabit ethernet port at the very end in blue. RAM Slot And Opening The iMac Up. For those who would want to upgrade the RAM on their iMac, the method has not changed from previous versions of the platform. To replace/upgrade the RAM on the latest iMac, all you need to do is open the RAM release door by pressing on the RAM release button located underneath it. The rest of the procedure is pretty simple. Opening the iMac up also remains the same. 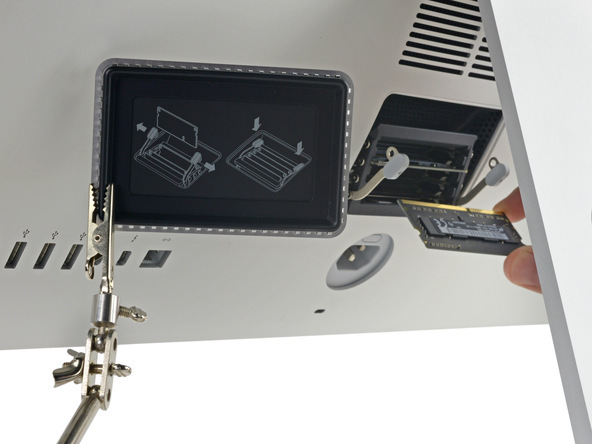 All that you need to open the iMac up is a sharp edged tool for cutting the adhesive tape on the edge of the screen and a durable, plastic card to pry the screen open. Once you’re done cutting the tape and have separated the two edges of the screen, you’ll be presented with your first look inside Apple’s brand new 5K Retina iMac. Voila. Since it comes with the name, the first order of business when opening the ‘5K’ Retina iMac up would be taking a look at what makes the 5K display of the device tick. The 5K display for the Retina iMac is manufactured by LG. Take a look at the actual component and the surrounding display below. So What Makes The 5K Display Tick? Now that the iMac has been opened, and the display separated from the logic board, we can take a look in detail at what hardware Apple has chosen and equipped the 14.7 million display with. Starting from the left of the display panel, the first thing we see is the Texas Instruments NH245 8-Bit Dual-Supply Bus Transceiver. This has been marked with a red rectangle in the image above. Next on the list is the Texas Instruments BUF16821 Programmable Gamma-Voltage Generator and Vcom Calibrator. Moving to the center of the display panel, we get to see two more NH245s and the Parade Technologies DP665 LCD Timing Controller, a feature which Apple also highlighted on it’s launch event for the Retina iMac. The green box on the extreme right of the image is the Texas Instruments TPS65270 Monolithic Dual Synchronous Buck Regulator. 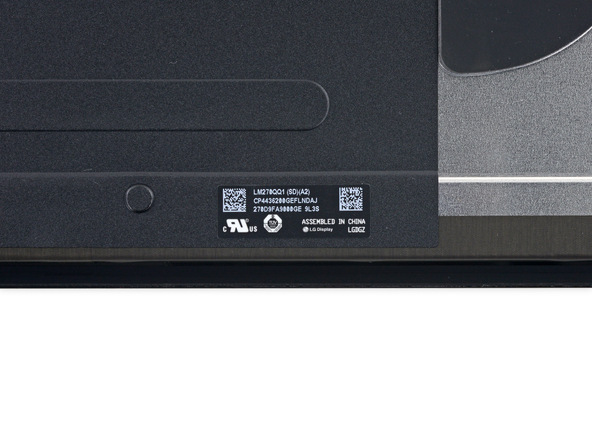 And finally, the last component on our list for the display of the 5K Retina iMac is the Texas Instruments TPS65168 High Resolution Fully Programmable LCD Bias IC for TV. For more information on these components, head over to Texas Instruments’ website. They’ve got everything you’d like to know about the components over there. The Logic Board, Processor, GPU And More. Aside the changed display components, Apple has kept the rest of the hardware similar to the one found on last year’s 27 inch iMac. 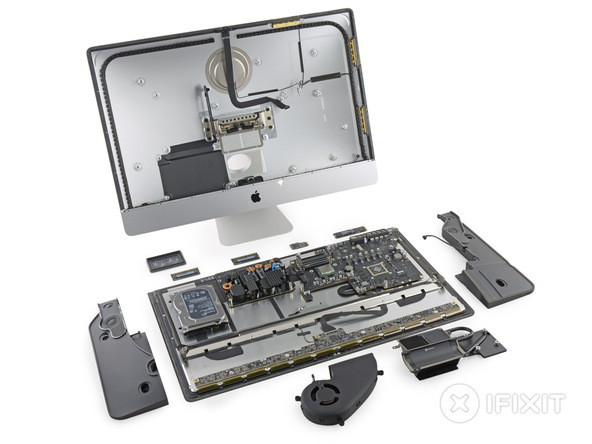 In fact, according to iFixit, removing the logic board of the Retina iMac requires the same method as on the previous 27 inch iMac. 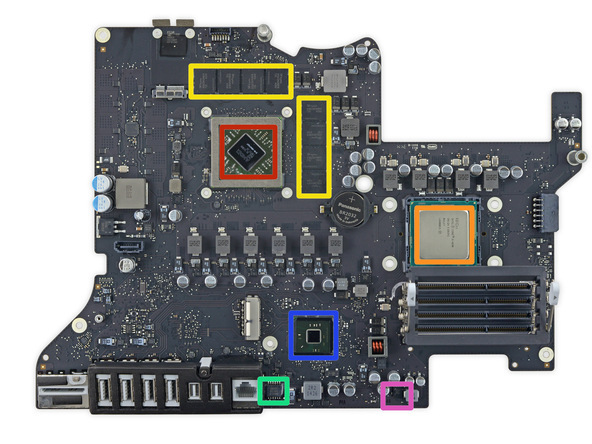 So after the logic board has been removed and isolated, lets finally take a look at the components which adorn it. The box in the red, as many of you would have guessed correctly is AMD’s Radeon R9 M290X GPU. Intel’s Core i5-4690 CPU can be pictured in the orange colored box. 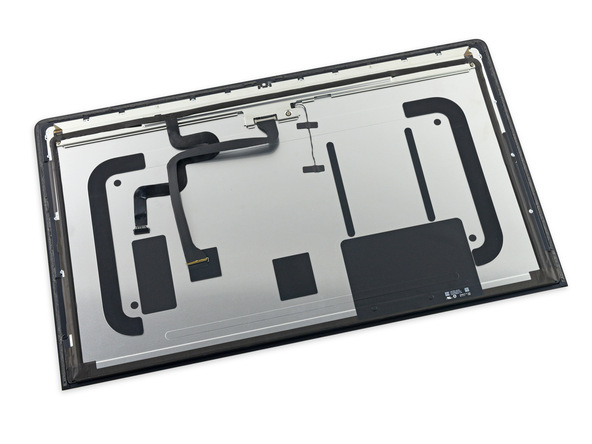 The CPU can easily be removed and replaced on the logic board. The yellow rectangles represent eight modules of SK Hynix H5GC2H24BFR 256 MB GDDR5 SGRAM for a total of 2 GB of memory. The green, blue and purple boxes are Delta Electronics 890CF 143003, Intel NB430029A00200 Platform Controller Hub and Fairchild Semiconductor DE32GV respectively. 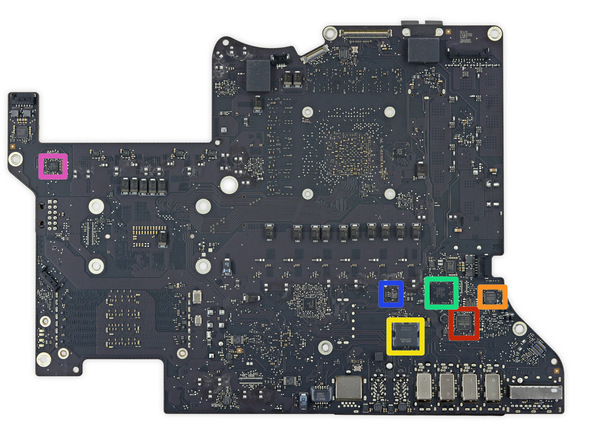 The front of the logic board features Broadcom’s BCM5776 Gigabit Ethernet Controller in red. For Audio on the Retina iMac, we have the Cirrus Logic 4206BCNZ Audio Controller in red. Intel’s Thunderbolt makes an appearance in yellow with the Intel DSL5520 Thunderbolt 2 Controller. The green box shows the LMF4S1EH 5BBCIG 47A6HPW. Temperature sensing on the iMac is carried out by the Microchip Technology 1428-7 420BE5A BMY System Management Bus (SMBus) Temperature Sensor and for muti-phase core voltage regulation we have the Intersil ISL6327 Enhanced 6-Phase PWM Controller. 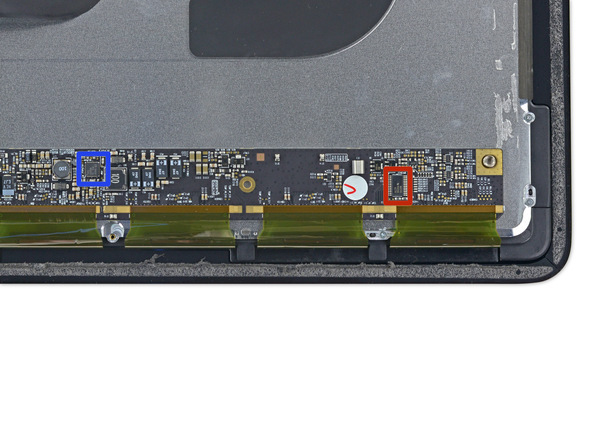 The SSD on the iMac is the same as the one found on the 13 inch Retina Mac Book Pro. It comes with four SanDisk 05131 016G 16 GB NAND Flash modules on each side for a total storage capacity of 128 GB (in Red). 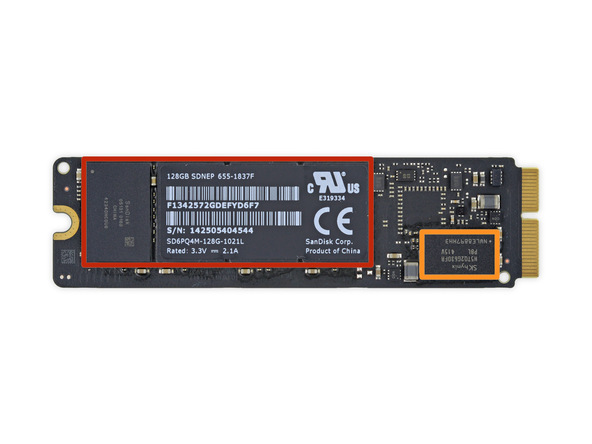 We also get to see the SK Hynix H5TQ2G63DFR 2 GB DDR3 SDRAM in orange. 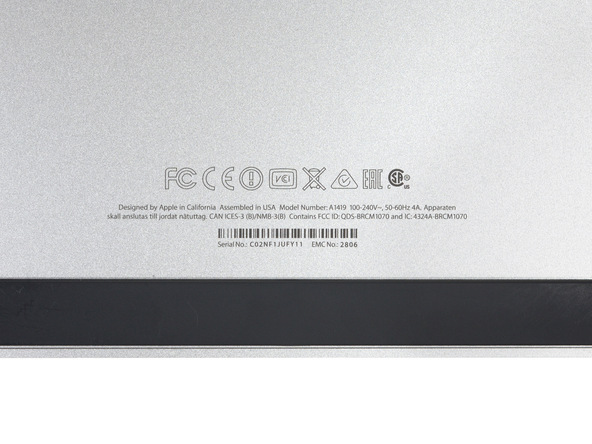 The AirPort/Bluetooth card also stays the same on the Retina iMac from last year’s 27 inch iMac. The red rectangle represents Broadcom BCM4360KML1G 5G WiFi 3-Stream 802.11ac Gigabit Transceiver, the Skyworks SE5516 Dual-Band 802.11a/b/g/n/ac WLAN Front-End Module is in orange while the bluetooth module in yellow is the Broadcom BCM20702 Single-Chip Bluetooth 4.0 HCI Solution with Bluetooth Low Energy (BLE) Support. So this marks the end of the iMac dissection. Liked what you saw? Could Apple have changed anything else? Let us know in the comments section. Oh and before you get any ideas to open up your iMac as shown in the start of this post, you should do so at your own risk and know that this is not a tutorial for opening your iMac up. Cheers.